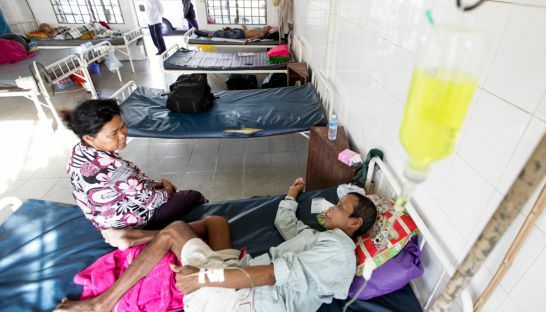 A quicker diagnosis and a shorter and cheaper course of treatment for multidrug-resistant TB patients in Cambodia could soon be on the horizon. The World Health Organization recommends countries with high incidences of TB, including Cambodia, begin implementing the new treatment regimen based on studies in 10 countries. “Cambodia, as a WHO member state, is of course expected to take note of this recommendation and adapt it, according to its local epidemical context,” said Ernesto Jaramillo, a TB expert with the WHO. Health officials in Cambodia will develop a plan to implement the new regimen by late 2017 or early 2018, said Dr Mao Tan Eang, director of the National Centre for Tuberculosis and Leprosy Control. The new treatment, which costs less than $1,000 per patient, could be completed in nine to 12 months, compared to the current period of 18 to 24 months, said Tan Eang. Officials would phase out the existing regimen. “We hope to be more efficient and cost-effective,” he said. Although TB is a leading cause of death in Cambodia, a 2015 Yale Global Heath Review study found that multi-drug resistant TB hasn’t been a significant problem, but rates are rising. In 2015, 70 multidrug-resistant TB cases were identified in the Kingdom, and officials expect to identify 145 this year, Tan Eang said. It’s too early to estimate funding levels needed, he said. US Embassy spokesman Courtney Woods said that once the WHO releases the guidelines in June, USAID will discuss with the national centre how it can “support the roll-out of the new recommendations at the country level”.